You need traffic report website, was able to use this application. However, it is not the least bit helpful if you use the application for free. In the reason, this application will limit you in using the facilities there in. Another thing of this, if you buy this app. All facilities can be run, such as: Knowing Keyword, the number of visitors per hour/day, State visitors, page often in the open, the number of keyword and other equipment for the module you in updating your Website optimization. Don't lose out, if it is in use. In fact, this application is very helpful, if your website's performance in doing. The other advantage, you do not need to use a pc or Notebook to check traffic visitor. Simply, just use your Windows phone easier and can be used anywhere. 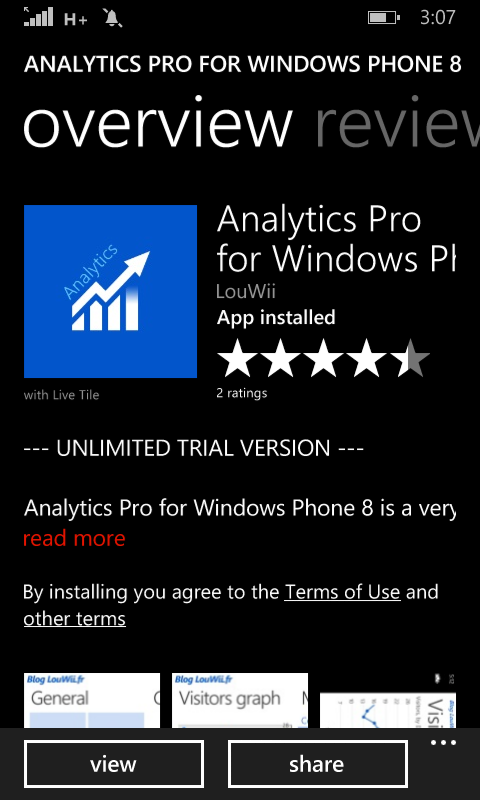 Application of Analystics, can you get in the windows store. Download, install, login and run the application. You are on the website page WINDOWS MOBILE PHONE - setting and Upgrade. Analystics PRO With the link URL http://hand-uk.blogspot.com/2015/02/analystics-pro.html for this articles, you can bookmark or share to any. Our expectation that Windows smart phone users, can understand and know about OS Windows phone. Analystics PRO Is a link for you, How to use the pure smart phone.